Alexander Herzen believed that any socialist revolution in Russia would have to be instigated by the peasantry. According to Edward Acton, the author of Alexander Herzen and the Role of the Intellectual Revolutionary (1979): "Nineteenth-century Russia was overwhelmingly a peasant society, and it was to the peasantry that Herzen looked for revolutionary upheaval and socialist construction. Central to his vision was the existence of the Russian peasant commune. In most parts of the empire the peasantry lived in small village communes where the land was owned by the commune and was periodically redistributed among individual households along egalitarian lines. In this he saw the embryo of a socialist society. If the economic burdens of serfdom and state taxation were to be removed, and the land of the nobility made over to the communes, they would develop into flourishing socialist cells." Herzen's ideas had a significant influence on intellectuals and attempts were made to form a socialist peasant party. In 1896 the Northern Union of Socialist Revolutionaries was formed. This was followed by other such groups in other parts of Russia. 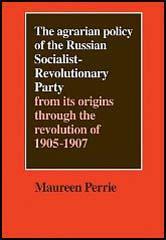 In 1901, some of the leading figures in these groups, including Catherine Breshkovskaya, Victor Chernov, Gregory Gershuni, Nikolai Avksentiev, Alexander Kerensky and Evno Azef, founded the Party of Socialist Revolutionaries (SR). The main policy of the SR was the confiscation of all land. This would then be distributed among the peasants according to need. The party was also in favour of the establishment of a democratically elected constituent assembly and a maximum 8-hour day for factory workers. Victor Chernov edited the SR journal, Revolutionary Russia, where he argued against Marxists who claimed that the peasants were a totally reactionary social class. George Buchanan claimed: "Chernov was a man of strong character and considerable ability. He belonged to the advanced wing of the SR party, and advocated the immediate nationalization of the land and the division among the peasants awaiting the decision of the Consistent Assembly. He was generally regarded as dangerous and untrustworthy." The SR, was influenced by the tactics used by the People's Will and had a terrorist wing, the SR Combat Organization. Membership of this group was secret and independent of the rest of the party. Gregory Gershuni, became its head and was responsible for planning the assassination of the Minister of the Interior, Dmitry Sipyagin. The following year he arranged the assassination of N. M. Bogdanovich, the Governor of Ufa. Gershuni was unaware that his deputy, Evno Azef, was in the pay of the Okhrana. In 1904 Azef secretly provided the secret police with the information needed to arrest and try Gershuni with terrorism. Eugen Levine was one of those who joined the Socialist Revolutionary Party. His wife, Rosa Levine-Meyer, the author of Levine: The Life of a Revolutionary (1973) pointed out: "He (Levine) received his first revolutionary ideas from the Social Revolutionaries whose programme included acts of individual terror. They believed that by assassinating certain dignitaries of state, above all the Czar, they could shatter the foundation of the existing system and bring about socialism. This programme called for a great deal of individual gallantry and self-sacrifice. It was only too natural that the young and inexperienced Levine should be fascinated by its heroic aspects. To correct injustice, to give his life for the oppressed - had this not been his dream since childhood? He became an enthusiastic member of that party." After Gershuni's arrest Evno Azef became the new leader of the SR Combat Organization and organized the assassination of Vyacheslav Plehve in 1904 and Father Gregory Gapon in 1906. At the same time he was receiving 1,000 rubles a month from the Okhrana. Several members of the police leaked information to the leadership of the SR about the undercover activities of Azef. However, they refused to believe the stories and assumed the secret service was trying to undermine the success of the terrorist unit. The SR played an important role during the 1905 Revolution. It led a rising in support of the Potemkin Mutiny and Nikolai Avksentiev was one of the main leaders of the St Petersburg Soviet. Although the Socialist Revolutionaries decided to boycott the Duma elections in 1905, some members stood as Trudovik (Labour) candidates. In February, 1907, the SR stood won 34 seats while the Trudovik had over 100 successful candidates. The Socialist Revolutionaries continued to infiltrated by agents employed by Okhrana. Between 1911 and 1914, Dmitri Bogrov supplied information about the party. However, in what appeared to be an act of remorse, Bogrov entered the Kiev Opera House on 1st September, 1911, and assassinated the Minister of the Interior, Peter Stolypin. After the February Revolution, a former member of the Party of Socialist Revolutionaries, Alexander Kerensky, was appointed as Minister of Justice. Later, Victor Chernov entered the cabinet as Minister of Agriculture and Kerensky became prime minister. The First Congress of Soviets that was held in June, 1917, had 1,090 delegates representing more than 400 different soviets. Of these, 285 were Socialist Revolutionaries, 248 Mensheviks and 105 Bolsheviks. Soon afterwards the SRs split between those who supported the Provisional Government and the Bolsheviks who favoured a communist revolution. Those like Maria Spirdonova and Mikhail Kalinin who supported revolution became known as Left Socialist Revolutionists. The party strongly opposed the Bolsheviks during the October Revolution. In the elections held for the Constituent Assembly in November, 1917, the SR won 20,900,000 votes (58 per cent), whereas the Bolsheviks won only 9,023,963 votes (25 per cent). In 1918 the Soviet government closed down the Constituent Assembly and banned the SR and other anti-Bolshevik parties. Some SRs now resorted to acts of terrorism. On 30th August, 1918, Vladimir Lenin was shot by Dora Kaplan and soon afterwards Moisei Uritsky, Commissar for Internal Affairs in the Northern Region, was assassinated by another supporter of the SR.
(1) David Shub was a member of the Social Democratic Labour Party who emigrated to the United States. Later he wrote about the leadership of the Socialist Revolutionaries. While conflict raged in Social Democratic ranks, the Revolutionary movement was not marking time in Russia. A new party had come on the scene and had stirred fresh currents in the Russian people. This was the Socialist Revolutionary Party. The leaders of the party were Catherine Breshkovsky, who had served six prison terms and spent more than twenty years in Siberia; Mikhail Gotz, son of a Moscow millionaire and a famous Siberian exile; Gregory Gershuni, whose Terrorist Brigade carried out the assassination of leading reactionary Ministers and Governors; Victor Chernov; and a number of old revolutionaries of the People's Will. The SR Battle Organization was founded by Gregory Gershuni in 1902; its first act, in the same year, was the execution of the Minister of Education Sipyagin by the student Balmashev (who was later hanged). On the day after the murder, the SR party published under a similar verdict. The arrest of Gershuni, who was delivered to the police by Azef, caused the latter's promotion to the top leadership of the terrorist detachment. A man named Boris Savinkov, for whom terrorism was a vocation and whose courage was indomitable, now found himself under the orders of the agent-provacateur. In 1904 the Prime Minister, Plehve, fell mutilated by Yegor Sazonov's bomb. Sazonov had organized the assassination on instructions from Azef. (3) Praskovia Ivanovskaia , who served fifteen years in prison for her part in the assassination of Alexander II, also helped to murder Vyacheslav Plehve. The conclusion of this affair gave me some satisfaction - finally the man who had taken so many victims had been brought to his inevitable end, so universally desired. Azef sat in a very dangerous position, especially after Gershuni's arrest, and he had to think first of his own safety. A continual series of arrests, and a long train of assassination attempts gone awry, could only help convince his SR colleagues that they had a traitor in their midst. If he were found out, his game would be over, and so, most probably, would be his life. On the other hand, if he could successfully plan and accomplish the murder of Plehve, his position among the SRs would be secured. Azef had little love for Plehve: as a Jew, he could not help but resent the Kishinev pogrom and the minister's reputed role. So far the people of Moscow have behaved with exemplary restraint. For the moment, only enthusiasm prevails, and the struggle which is almost bound to ensure between the bourgeoisie and the proletariat has not yet made its bitterness felt. The Socialist Party is at present divided into two groups: the Social Democrats and Soviet Revolutionaries. The activities of the first named are employed almost entirely among the work people, while the Social Revolutionaries work mainly among the peasantry. The Social Democrats, who are the largest party, are, however, divided into two groups known as the Bolsheviki and the Mensheviki. The Bolsheviki are the more extreme party. They are at heart anti-war. In Moscow at any rate the Mensheviki represent today the majority and are more favourable to the war. (6) George Buchanan, My Mission to Russia and Other Diplomatic Memories (1922). 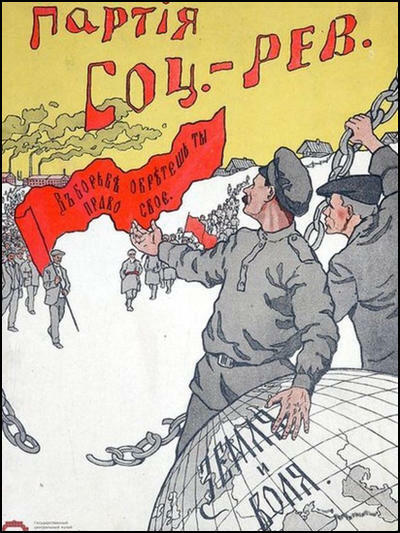 The Social Revolutionaries (SRs) were agrarian, in contradistinction to the Social Democrats, who represented the interests of the proletariats of the towns. The watchword of the former had always been "Land and Liberty". During the latter part of the last and the commencement of the present century they had adopted terrorism as a weapon for attaining their ends. (7) Nikolai Sukhanov, was a leading member of the Petrograd Soviet. 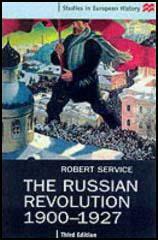 In his book The Russian Revolution 1917, he recalled his impression of Victor Chernov. In the creation of the SR Party Chernov had played an absolutely exceptional role. Chernov was the only substantial theoretician of any kind it had - and a universal one at that. If Chernov's writings were removed from the SR party literature almost nothing would be left. Without Chernov the SR Party would not have existed, any more than the Bolshevik Party without Lenin - inasmuch as no serious political organization can take shape round an intellectual vacuum. But Chernov - unlike Lenin - only performed half the work in the SR Party. During the period of pre-Revolutionary conspiracy he was not the party organizing centre, and in the broad area of the revolution, in spite of his vast authority amongst the SRs, Chernov proved bankrupt as a political leader. Chernov never showed the slightest stability, striking power, or fighting ability - qualities vital for a political leader in a revolutionary situation. He proved inwardly feeble and outwardly unattractive, disagreeable and ridiculous. (8) Mark Vishniak, a member of the Socialist Revolutionaries, later wrote about his impressions of Victor Chernov at the first meeting of the Constituent Assembly. His speech was couched in the language of internationalist and socialist ideas, with occasional undertones of demagogy. It was as though the speaker was deliberately seeking a common language with the Bolsheviks, and trying to persuade them of something instead of dissociating himself from them and standing up against them as representatives of Russian democracy.